If you’re a homeowner in the Triangle looking for garage and wall covering solutions, look no further than Carolina Coatings & Tile. We offer a wide variety of seamless flooring and wall solutions like epoxy and stained concrete that are attractive and fit perfectly into your lifestyle. Our talented team is experienced ready to take on any job – whether it’s 5,000 or 10,000 square feet. The flooring system to fit any budget, this solution is available in a variety of thicknesses. For example, if you’re looking for a light application, a thin film application of 20 millimeters may be perfect for your garage. Need something larger? A thick application up to ⅜” may do the trick. Epoxy will stand the test of time without showing much wear and tear because of its extreme durability and color retention. Perfect for high-traffic garages and spaces with harsh environments. Polyaspartic systems are available in thin film applications of 20 millimeters through thick overlays of ⅜” or more. One of strongest coatings in the industry, polyurethane has great thermal shock resistance, moisture and chemical resistance. Polyurethane coating has a flexible surface that is ideal for a garage because of its ability to absorb impacts from vehicles, tools, and heavy sports equipment. MMA has impressive UV protection and a high resistance to chemicals. Also resistant to cracking, this floor is used in spaces like chemical and food processing facilities, freezers and refrigerated warehouses. 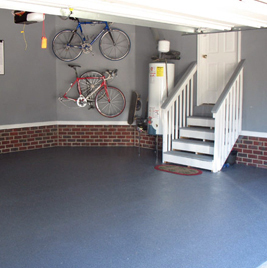 If you need a garage flooring system but don’t know where to start, contact the experts at Carolina Coatings & Tile. Our trained flooring professionals will help you find the best solution for your home.